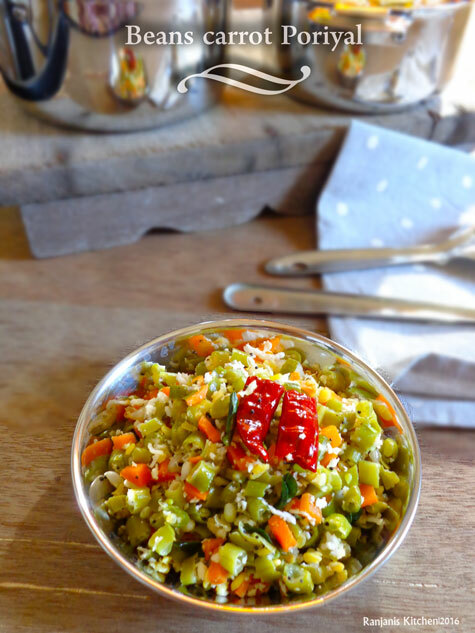 Beans Carrot poriyal recipe – south indian side dish goes well with sambar, kara kuzhambhu or vatha kuzhambhu. If you think the beans are time consuming to chop,We can chop beans and carrot and keep it in refrigerator a day before to prepare. The process will be easy if you cut the ends for all beans and chop as a bunch like 4 to 5. To include beans in food atleast once in a week is good for health as it is fiber rich vegetable and reduces cholesterol. This recipe is simple and delicious to have without coconut also. 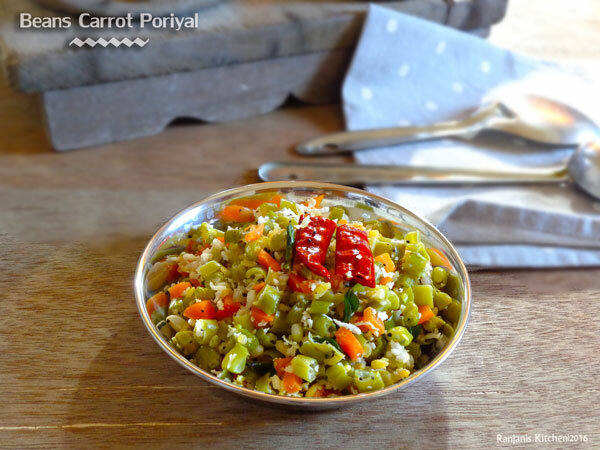 Check out how to make beans carrot poriyal. Cut ends of beans and peel the skin of carrots, wash well and chop into fine pieces. In a sauce pan, add chopped veggies, 1 cup of water , moong dal or channa dal and salt. Cook for 10 mins or till the veggies get cooked well. Drain the excess water from veggie and keep aside for seasoning. Heat a wok, add oil, once it heats up add mustard, urad dal , onions, red chillies, curry leaves and hing. 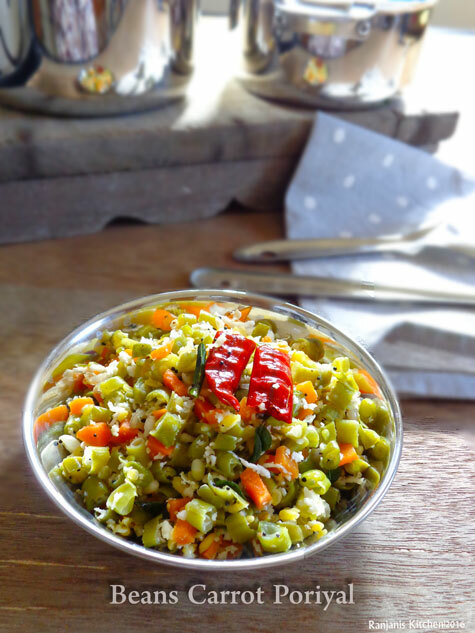 Saute till urad dal slightly changes to golden. Add boiled veggies to it and stir for a minute. Add shredded coconut, give a mix and turn off the flame. You can use coconut oil also for seasoning. If you don’t want to drain the boiled water, you can cook the veggies in ½ cup of water till it completely absorbs water and season it.